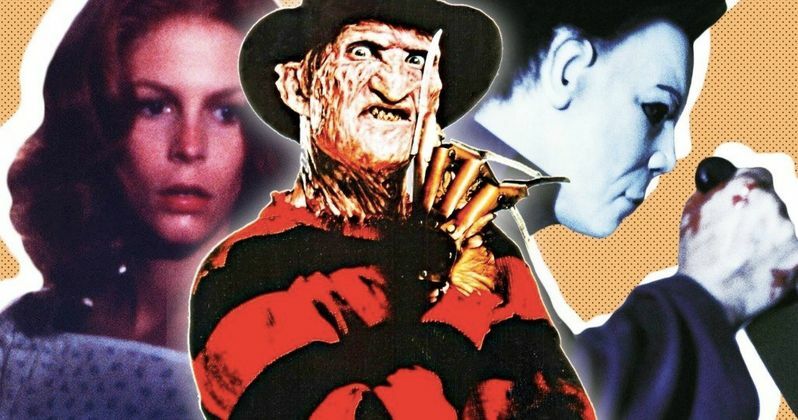 Fans of classic horror icons are having themselves one heck of a week. The new Halloween just opened in theaters and has been quite the crowd-pleasing affair thus far. Plus, Robert Englund is set to return as the famed Elm Street slasher Freddy Krueger for the first time in 15 years on the upcoming episode of The Goldbergs. But as Englund revealed in a recent interview, these two franchises actually crossed over years ago, in a very small way, when the actor went to work on John Carpenter's original 1978 Halloween. Robert Englund has been making the rounds promoting the new episode of The Goldbergs, which is titled Mister Knifey-Hands and airs tonight on ABC. During an interview, the actor revealed that he actually wound up working behind the scenes, in a very small way, on the set of John Carpenter's original Halloween in 1978. Here's what Englund had to say about it. "It's so funny, I actually had a roommate, back when they did the original Halloween... the John Carpenter one. And he conned me into going to Pasadena one day, with garbage bags full of dead leaves. And we were working on the set of the original Halloween, throwing the dead leaves around. So it looked like Autumn... it looked like Fall back in the Midwest." A Nightmare on Elm Street was released in 1984 and spawned one of the most successful horror franchises in history. That means Robert Englund was fooling around with those leaves on the set of Halloween years before he became an icon himself. But it's still amazing to think that the man was even, if only in the slightest way, involved with Halloween as well. The last time we actually saw Robert Englund on screen as Freddy was in 2003's Freddy vs. Jason, which gave horror lovers the showdown between Jason Voorhees and Freddy Krueger they had been dying to see for years. But we never got to see the beloved icon from A Nightmare on Elm Street do battle with Michael Myers. This is probably as close as we're ever going to get to such a thing. That said, it's very unlikely we've seen the last of Freddy Krueger, given what has been going on with the latest Halloween sequel, which has already made just shy of $100 million at the box office in less than a week. We've already heard word that LeBron James is looking to produce a Friday the 13th reboot. One would figure Freddy is next. The studio has intended to take another stab at the franchise ever since the remake failed in 2010. And while the plan has been to reboot the franchise, Robert Englund also said that he may have one more go around as Freddy Krueger in him. Whether or not that materializes remains to be seen, but either way, expect to see a new Elm Street movie sooner rather than later as studios attempt to chase the success Halloween has enjoyed. This news was first reported by Access Live.